It's not quite a complete reinvention for the series but Infinite Warfare makes some refreshing changes to deliver a confident and exciting shooter. All in all, Infinite Warfare is just about average with a few sparks here and there. The game feels a lot like the few of the other CoD titles I have tucked away on my shelf but with a few shiny upgrades. Same great mechanics, same beautiful visuals, familiar platform, and the baddest Call of Duty game since the original in Modern Warfare Remastered makes this an average title that won’t disappoint the die-hard Call of Duty fan. 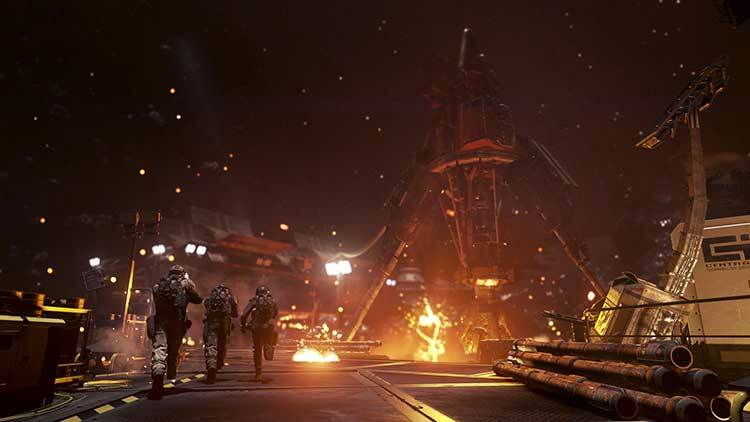 By venturing beyond Earth--and not just to other planets, but to space itself--Call of Duty found a canvas to produce its best story in years. 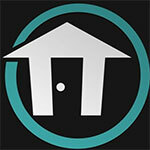 It reinforces the notion that a game's narrative is only as good as its characters. Given the campaign's accomplishments in space combat, it's puzzling that no effort was made to replicate its zero-G sensations in Infinite Warfare's multiplayer. And with the multiplayer lobbies already slow just after launch, I don’t have a good outlook for Infinite Warfare’s longevity on PC. The extras bundled with the main attractions—Zombies and a remaster of a nearly 10 year old game—are better than the main attractions. But those successes aren’t enough for me to recommend spending $70/£60. 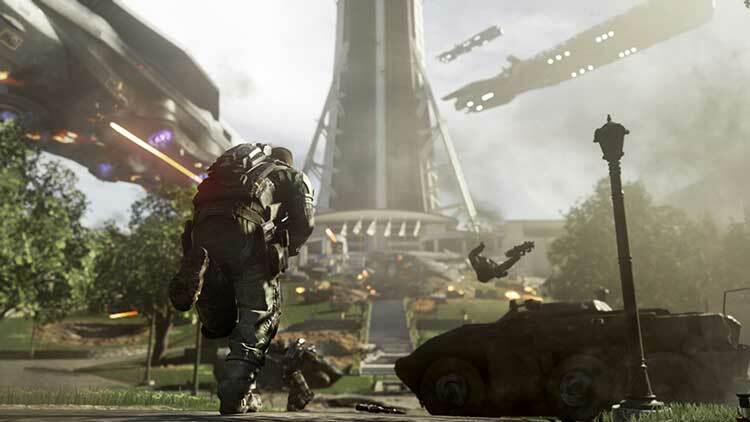 While Infinity Ward might have played it a little too safe when it came to the competitive multiplayer mode, the improvements in the single-player campaign and Call of Duty: Zombies are substantial. The single-player campaign, in particular, hooked me, and I hope that future campaigns in the Call of Duty universe get the same care. 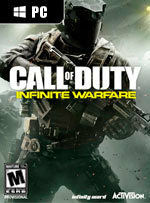 No doubt Call Of Duty will go on infinitely, and this game, like all the others, will be a massive hit. That’s no travesty against good taste or judgement, but it’d be a shame if it convinces Activision not to institute the kind of radical change the series needs. And which for the last couple of years it’s come close to but never quite pulled off. En Call of Duty: Infinite Warfare tenemos una campaña muy divertida y espectacular, y un multijugador con todos los vicios y virtudes de los últimos años, y para bien y para mal, demasiado parecido al del año pasado. Lo que gana en la campaña (mejor que Black Ops III), lo pierde en el multi (ligeramente peor que en el juego de Treyarch), y finalmente su ambientación futurista no nos ha parecido un problema precisamente, y de hecho lamentamos que no haya sido mejor explotada en el multijugador. La fórmula sigue intacta. Acción rápida y directa, cinematográfica, como si de una película palomitera se tratase. Esta vez, además, con un ritmo envidiable. Incorpora características de los últimos juegos (hackeo, drones, granadas eléctricas) y añade todo un atinado torrente de ellas inédito hasta ahora gracias a la gravedad cero, los combates en el caza y la selección de misiones secundarias. Tan accesible como siempre, más variado que nunca. Infinite Warfare no es el desastre que parecían presagiar aquellos que crucificaban su tráiler de estreno, pero tampoco es un juego a la altura de lo que una saga como Call of Duty demanda. A pesar de haber ido muy lejos en cuanto a la ambientación espacial, me quedo con la sensación de que esperaba más cambios y que la apuesta ha quedado a medias y, por si fuera poco, el multijugador supone un descenso de calidad respecto a episodios anteriores. Unter dem Strich ist Infinite Warfare also ein guter Shooter, der allerdings im Serienumfeld und auch im Vergleich mit der starken Konkurrenz Titanfall 2 und Battlefield 1 den Kürzeren zieht. Zwar steht die finale Wertung noch aus, aber wenn die öffentlichen Server stabil laufen und wir von den Multiplayer-Matches weiterhin überzeugt sind, wird sich die Wertung am Ende im unteren bis mittleren 80er-Bereich einpendeln. 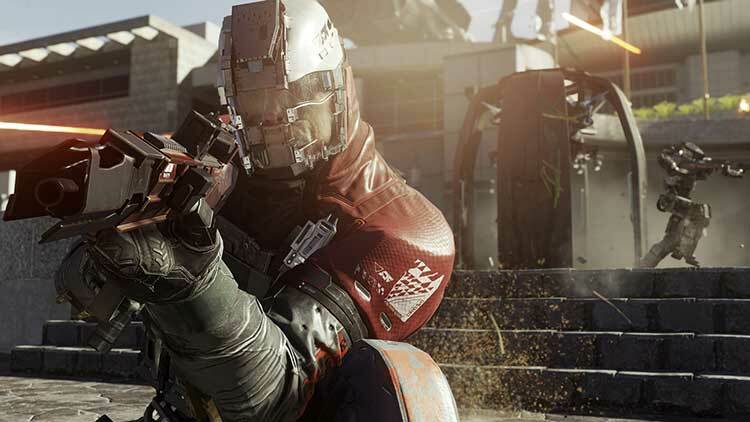 Call of Duty: Infinite Warfare sieht aus wie ein mutiger Schritt nach vorn. Aber es sieht eben nur so aus. Egal in welchem Modus, Ähnlichkeiten zu Black Ops III sind in vielen Punkten mit Sicherheit nicht rein zufällig und vielleicht auch so gewollt. Was wiederum dazu führt, dass sich Call of Duty: Infinite Warfare nicht so frisch anfühlt, wie es das vielleicht tun sollte. Einen echten Totalausfall gibt es nicht, aber die Kampagne ist, trotz mehr Abwechslung, ein überraschender Rückfall in alte Erzählmuster. 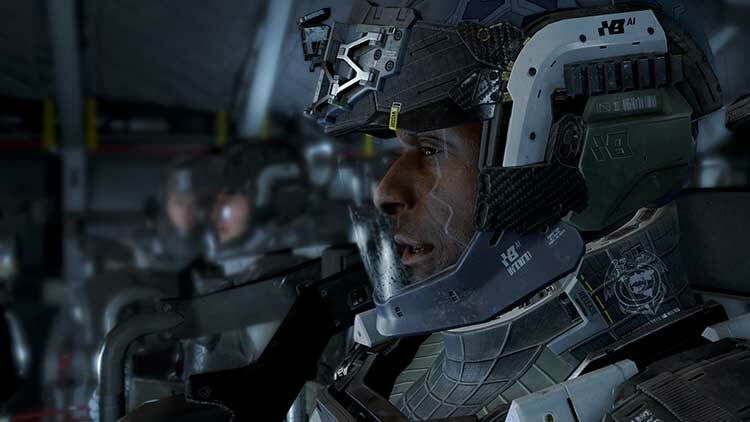 Honnêtement, nous ne pouvons que conseiller aux joueurs de prendre la version Legacy de Call of Duty : Infinite Warfare. Pour 10€ de plus que la version standard, les joueurs auront accès à l'un des meilleurs épisodes de la saga, qui en plus d’offrir une campagne solo sympathique, permettra aux joueurs d’avoir un multijoueur plus classique où jetpack et courses sur les murs ne seront pas de la partie. Après y avoir joué pendant plusieurs dizaines d'heures, ce Call of Duty Infinite Warfare laisse un désagréable arrière-goût de déception. Non pas que le titre soit mauvais, loin de là, mais il aurait pu faire tellement mieux. Dommage puisque les développeurs avaient clairement la volonté de proposer quelque chose de différent, ce qui se ressent principalement en campagne. Avec ses batailles spatiales, ses combats en gravité zéro, sa progression beaucoup moins linéaire que par le passé, Infinite Warfare propose du neuf tout en parvenant à se réinventer. Riassumendo, un prodotto solido che non vuole osare, ma che forse dovrebbe perché i contenuti sono tanti e non certo brutti, ma il divertimento a volte fatica a ingranare. Call of Duty: Infinite Warfare — это отличный голливудский блокбастер. Да, опять. Каждый год на старом движке (но выглядит игра все равно здорово), с глупым искусственным интеллектом врагов, со звездами кино и сериалов в главных ролях — тут ничего не изменилось. Но несмотря на то, что большая часть геймплея — это типичное для Call of Duty «беги и стреляй», иногда игра предлагает попробовать интересные механики — динамичные бои на космических кораблях, перестрелки в открытом космосе, стелс с переодеванием в духе Hitman. Son sözlere gelecek olursak, Call of Duty: Infinite Warfare, yalnızca hikaye mod'u ile satışa sunulsaydı. Benden 90 puanı alma ihtimali olabilirdi. Şuan için başarısız çoklu oyuncu mod'unun gölgesinde kalan yapım, yine de saf hikayesi ile aldığı puanı hakediyor. 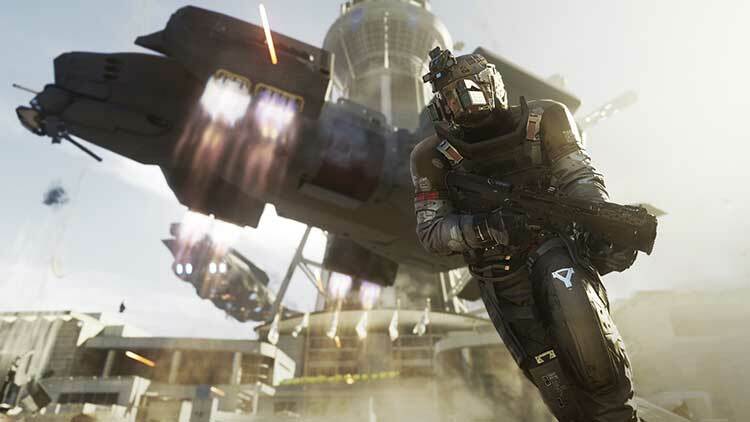 Eğer benim için multiplayer önemli değil, ben sinematik bir FPS arıyorum diyorsanız, Call of Duty: Infinite Warfare'i size kesinlikle önerebilirim. Ancak CoD serisinde genelde çoklu oyuncu tarafında vakit harcıyorsanız, kesinlikle uzak durun, hayal kırıklığına uğrarsınız. CoD się starzeje i w obecnej wersji powinien przejść już na emeryturę. Problem w tym, że seria znalazła się pod ścianą i wyjście z takiej sytuacji może być bardzo trudne. Paradoks tego wszystkiego polega na tym, że IW to całkiem niezła gra. Efektowna i wartka kampania oraz solidny multiplayer parę lat temu by zachwyciły, ale dzisiaj już nie.